The late-blooming prospect narrative is a familiar one for his family, and Jaden McDaniels' prolific summer rise has drawn the attention of Kentucky. The late-blooming prospect narrative is a familiar one in the McDaniels family. His brother, Jalen, also came into his game on the later side. He averaged 10.5 points and 7.9 rebounds as a sophomore at San Diego State last season and his considered a potential first-round pick in next year’s NBA draft. Like Jalen, Jaden is tall (6’9”), long (wingspan near 7’), and thin (185 pounds), and is comfortable handling the ball on the perimeter, even running point for his Seattle Rotary team on crucial late-game possessions at Peach Jam. Jaden grew up idolizing John Wall, heeding his father’s message that just because he was taller it didn’t mean he couldn’t handle the ball that same way. It’s tempting to watch McDaniels now, with his wiry frame, improving perimeter shooting, and general on-court bearing and think of Kevin Durant, a comparison as unfair as it is inevitable for a long, skilled wing who can knock down jumpers over defenses. It was that similar build that first made McDaniels a prospect worth watching a year ago but the development of his game that took him to this new level. A bevy of coaching staffs are now eagerly trying to make that bet, but McDaniels is keen to let the process play out slowly. “I’m gonna take my time with it, just look over everything,” he said. Given his Seattle-area roots, some expect him to remain on the West Coast like his brother. At Peach Jam, Jaden told reporters he’s open to playing across the country, though there might be one important and understandable catch. -As for the actual team competition at the event, it was D.C.-based Team Takeover that took home the title. TTO had not lost during the EYBL season before falling to Nike Team Florida in pool play at this event, but they got back on track to win the rest of their games pretty decisively. Five-star forward Armando Bacot Jr. took home MVP honors for averaging 11.6 points, 12.1 rebounds, and 1.9 assists while playing stellar defense, and Takeover’s enthusiastic fan section deserved an award of its own. -One of the buzziest players this weekend was C.J. Walker, a 6’8” forward from Florida-based Each 1 Teach 1 who turned some heads with some explosive dunks and reportedly picked up a handful of offers (Memphis, Louisville, Texas) as a result of his play. Considered a fringe top-50 prospect a week ago, Walker’s stock is surely rising. -Top Class of 2019 point guard Cole Anthony (son of Greg) certainly lived up to the hype, showing a well-rounded game and a relentless motor. He said he wants to play somewhere where he will be a key contributor on a national title contender. He should have every option he would want. -Keep an eye on Christian Koloko, a slim 7-footer from Cameroon who plays for the Oakland Soldiers and has only been playing in the U.S. since the beginning of this year. He showed a good knack on defense and played with a pesky intensity that wound up irking No. 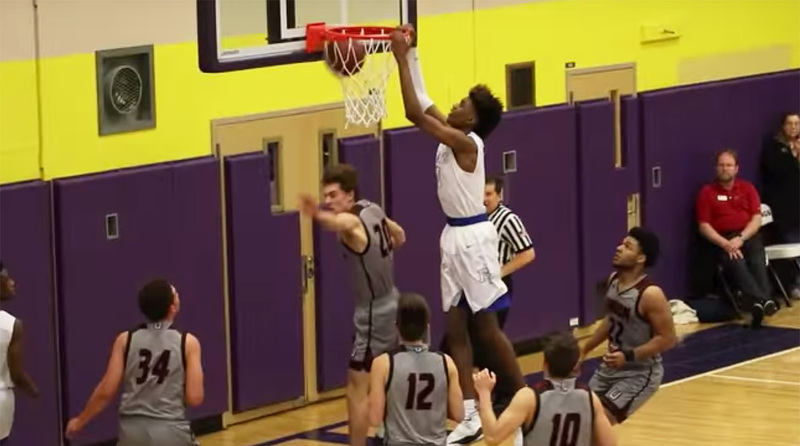 1 overall recruit James Wiseman enough that Wiseman was ejected from their game after two technical fouls. Assuming he keeps filling out his frame, Koloko has a lot of potential. -Wherever he ends up, opposing forwards are not going to be happy to see Vernon Carey Jr. step on the floor. The son of a former Dolphins offensive tackle, Carey is 6’11” and built like he belongs on the gridiron. He’s considered in the mix with Wiseman and Anthony for the top spot in this class. -Few prospects are more fun to watch as Jalen Lecque, a five-star combo guard from New York Renaissance who feels like a big play waiting to happen. One of the most wowing plays I saw all week was a sensational alley-oop Lecque threw down from teammate Jonathan Kuminga, a 6’8” player from the Class of 2021 — i.e. a soon-to-be sophomore — who stood out in his own right. File that name away for future reference. -Another 6’8” Class of 2021 guy who stood out: Paolo Banchero of Seattle Rotary, a versatile forward whose mother, Rhonda, played in the WNBA and whose father, Mario, played tight end at Washington. -One of the most impressive not-quite-five-star (as in, four-star) recruits I saw was Cassius Stanley from L.A.-based runners-up Team WhyNot. He looked smooth and polished in everything he did, getting to the rim seemingly whenever he wanted without ever appearing out of control. -Among the most-discussed subjects of the weekend was the possibility that the NCAA — under advisement from the Commission on College Basketball formed in the wake of the FBI’s investigation last fall—might not allow coaches to attend events like Peach Jam after this year. Thankfully, after Gary Parrish of CBS Sports wrote an excellent column ripping the idea, arguing that the event benefits players and coaches alike and the change would solve nothing, the column’s widespread support appears to have resulted in the idea losing steam. Let’s hope so. Should the NCAA Be Worried About the Lawsuit It's Facing From Former Louisville Players?